La Lola Churreria now offers Lola Loops. It’s their classic hot, made-to-order churros clasicos in the shape of a ‘lazo,’ the Spanish word for a bow or ribbon. Customize your churros by choosing from the selection of chocolate coating of Dark Chocolate, White Chocolate, Butterscotch and Matcha, and select your topping from their choices of Marshmallows, Sprinkles, Peanuts, Crushed Oreos or Almonds. Enjoy while it’s still hot. Each piece is priced at P120 only! Lola Loops make eating churros more fun and adventurous. Mix and match your choice of chocolate coating and toppings. More coatings and toppings are set to come. The pairings seem endless. 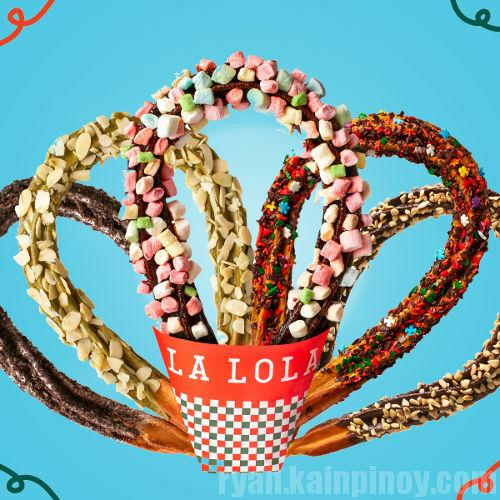 Lola Loops and other La Lola Churros varieties are available in all branches at Power Plant Mall; SM Aura Premier; U.P. Town Center; SM Megamall; Serendra; Eastwood Mall; SM City North Edsa; Estancia Mall; SM Mall of Asia; Robinsons Place Manila; Uptown Mall; SM City Cebu; Robinsons Magnolia; SM Southmall; SM City Pampanga, SM City Fairview and newly opened SM City East Ortigas and Glorietta 4. To learn more about La Lola Churreria, visit http://churrerialalola.ph, Facebook , Instagram and Twitter.